For as long as I can remember, Big Pete Pearson has been the King of the Blues here in Arizona. 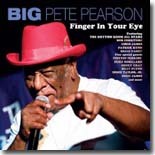 Definitely a lover, not a fighter, Big Pete is back with a great disc of all original tunes, Finger In Your Eye, on the Vizztone label. This record is so good that only reason I got out of my La-Z-Boy chair was to hit play again when it ended. So let�s get to it. The title cut, �Don�t Mess with Me (Finger In Your Eye),� opens with a rousing harmonica solo by Bob Corritore as the band settles in behind Pete so he can tell us his tale. Here we find that Pete is not a man to be trifled with and if you do, watch out. �Got a lot of money�and a brand new car�I know your loving is good�but stay where you are�.don�t you mess with me!� The girl�s fine but Big Pete�s been around the block and he�s not going to put up with her crap. Big Pete continues to draw the line on our next cut, �Short Change.� �I work hard every day�you treat me like a fool�two-time game you�re pulling, girl�you know I can�t use�hey baby�I�m sure going to draw a line�I want you to give all your money�where you spend your time!� Time for this girl to get out and don�t come back. Bruce Bears on the organ and Duke Robillard�s guitar support Pete�s effort to win his female companion over in our next cut, �The Time Has Come.� �I toss all night�sometimes I just can�t help but cry�I toss all night long�I just can�t help but cry�little bit of that love, girl�you know Big Pete is satisfied�. The baritone sax of Doug James lends a nice degree of sophistication to Duke�s guitar work on this laid back shuffle. Pete continues to tell this girl how he feels but it just doesn�t seem that she�s buying what Big Pete is selling. Joy turns to sorrow as Pete tells us about the pain he�s feeling in �Heartaches.� �Why did you leave me�why did you make me cry�you didn�t love me, baby�please, please�tell me the reason why!� Bruce Bears is back on the piano this time and Duke continues to utilize his fretboard genius to convey Big Pete�s pain and sorrow for this woman he loved so much. Mournful tones from Bob Corritore�s harmonica add the final brushstrokes to the sadness found in this tune. Finger In Your Eye closes with an effort by Big Pete to educate women on the ways of love in �Slippery When Wet.� �You�re like rain on a highway�you know it�s slippery when it�s wet�no matter how hard I try�little girl�I haven�t got you yet.� Big Pete�s woman has a way of lying to him and he�s tired of it��I�m so sad and sick of your lies!� This relationship is not going to end on a good note and Big Pete�s done all he can. Backing Big Pete on this record by the very capable hands of the Rhythm Room All-Stars with Bob Corritore on harp, Chris James on Guitar, Patrick Rynn on bass and Chris Fahey behind the drum kit. Add a host of guest performances from Pinetop Perkins, Duke Robillard, Bruce Bears, Henry Gray and others, and this gumbo is smoking hot and ready for your CD player. Probably the best place to grab a copy of this disc is from Pete�s label, VizzTone, at www.vizztone.com. And if you don�t mind, I�m headed back to my La-Z-Boy for one more listen of this new disc from our King of the Blues. 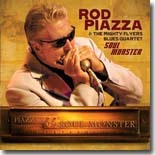 I�ve known Rod Piazza & the Mighty Flyers Blues Quartet for several years now and always look forward to being able to give new music by them a listen. Their latest, Soul Monster, is another in a long line of great discs from the band. It features some of what Rod believes is his strongest playing yet and a carefully chosen set list of originals and covers chosen by Rod to give the listener a �full blues experience.� Soul Monster does that and more, so let�s hit play. First out of the gate is the title track, an instrumental. Honey�s ability to play a funky bass beat on the piano never ceases to amaze me and Rod�s slow, mournful tones set the stage for what is yet to come. The first of three instrumentals, �Soul Monster,� is full of great riffs by Henry and the magical touch of Honey�s fingers on the ivories. We�re warmed up now so let�s keep going. �Can�t Stand to See You Go,� a classic tune by Jimmy Reed is up next and Rod�s settling into his groove. �Girl�you know I love you and�I can�t stand to see you go.� The band is very tight and Honey�s extended piano solo is particularly appreciated. Rod mentions David Kida�s backbeat on our next cut, �Cheap Wine,� and I�m definitely ready to get up and dance. �Cheap wine�.price ain�t never high�just a twist�oh, what a way to fly!� Cheap wine, the Mighty Flyers Blues Quartet in the house, sounds like a great party to me! The Bill Broonzy classic, �Key to the Highway,� is the next cover tune given the Mighty Flyer�s classic treatment and they more than do it justice. Rod�s harp is right on, Honey�s piano is strong in the background, Henry�s fretwork adds just the right amount of burst, and David�s got the back end covered. �Oh, honey�I got to say goodbye�I�m going along that lonesome highway�until the day I die!� Rod definitely has the keys to the highway and he�s obviously enjoying this ride. It�s not been that long ago since we�ve lost Sam Myers and Rod�s next tune is dedicated to the memory of Sam, �Tell Me About it Sam.� The tune�s original title was �Blues in 92� and Rod tells the story where the band is at a festival in Syracuse and Sam asks him to play the tune. It ended up that Sam sang the song and Rod blew the notes. I�ll leave the rest of the story for you to hear later, but it�s no secret that we all miss Sam dearly. �Queen Bee� is up next and Rod�s harp work leads the way as the band more than does the Slim Harpo tune justice. �Expression Session� is the third instrumental on Soul Monster and here Rod�s harp is at the forefront of the song. The Mighty Flyers Blues Quartet has such history that it�s great to just sit back in my chair while they let it loose. Rod was right when he made comment in the liner notes that this disc features some of his strongest harp work yet. He�s definitely on top of his game on this tune and there�s still more to come. Soul Monster closes with �Hey, Mrs. Jones,� a tune that owes its jazz influences to Jimmy Forrest, a bandmate on one of Rod�s earliest recordings. The married Mrs. Jones is prone to stray and Rod�s looking into the possibilities of hooking up. �Hey Mrs. Jones, can I come in�and by the way�are you alone?� Nothing but trouble here and Rod seems intent on pursuing his options with Mrs. Jones. It will catch up with him. Soul Monster is a very good record. I appreciate Rod�s liner notes that recognize the challenges the he and the band face when recording to continue to put out something they value as players�and something we value as listeners. Soul Monster passes the test with flying colors. I particularly enjoyed Henry�s vocals on �Talk to Me� and would have appreciated a vocal from Honey as well. Food for thought for the Flyers next disc. The band is touring hard in support of Soul Monster, so grab a copy when they come through or get it from their website at www.themightflyers.com. Let�s see just how well it passes your listening test! I first met Big James Montgomery at the 2008 Blues Music Awards in Tunica, Mississippi. That particular BMA show was a night full of surprises and challenges, but I remember James calmly sitting in his chair, waiting to perform. I don�t remember much of his performance from that evening, but his first release with the Chicago Playboys, Right Here Right Now (Blind Pig Records), is arguably the strongest record I have heard all year. It's one record I�m sure will be in my top 10 list at the end of the year. Next up is a testament to James�s mother, �A Mama Like Mine.� Definitely a tough woman, she kept James in line and made sure he grew up proper. �I�m so lucky y�all�she�s got a heart of gold�and oh, so kind�I just wished that everyone�had a mama like mine!� Rarely do you get to hear a band as diverse as this, with a great horn section that includes James on trombone, Charlie Kimble on saxophone and Kenny Anderson on trumpet. James and the Chicago Playboys harken back to the days of Otis Clay and Tyrone Davis with an infectious blend of R & B, blues and soul that you just keep coming back to and we�re just getting started. A funky bass backbeat from Larry Williams sets the tone for �On the Grind,� a tune proclaiming that music is James� life. Featuring a rap by Moseberry, �if it wasn�t for the music�I probably wouldn�t be alive�so I rock the sun�and I rock with the moon�going for broke�with nothing but hope and a plan�moving my mic stand from here to Japan�cause see�the hands on the clock�say I got to go get it�off on my grind!� The time for James to be doing what he�s doing is right now and there isn�t anything else he rather do, �cause these blues�is all I got�in these trying times�I gotta stay on my grind!� I love the texture that Moseberry�s rap brings to this song and Big James is proving to be a very astute observer of today�s society. �Help (Somebody Please)�, a classic tune by the O�Jays, is next. �I�m down�and I feel�all the way down�ain�t had no good loving�little girl�in quite a long time�and you see�girl�it�s a fight�woman don�t you know�I need you tonight!� James�s sorrow is real and he�s desperately in need of a good woman to love him. This amazing record closes with a wonderful version of Tyrone Davis� �Without You in My Life� and another tune by Big James, �Worry.� �There�s one thing I don�t worry about�I never have to worry about�the Blues!� As long as they have the Blues in their lives, Big James and the Chicago Playboys will be fine. Right Here Right Now is a testament to that. This is a very tight group and the record shows it. Great writing, very tight arrangements and that outstanding horn section all lead me to believe that we�re going to be hearing a lot more from Big James and the Chicago Playboys before they�re through. 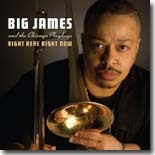 Grab a copy of this amazing disc from Blind Pig on their website, www.blindpigrecords.com, or from Big James himself at www.bigjames.com. Right Here Right Now is a classic record and we�re fortunate that Big James and his band are carrying on the lessons they�ve learned from their early influences: Little Milton, Albert King and Johnny Christian. It�s hard to believe its been two years since the Sean Carney Band ran off with the IBC title. From the moment they hit the stage, Sean�s band was in it to win it and took no prisoners. The paint was barely dry on the Gibson guitar Sean won as the Albert King award winner before the band was back on the road, heading to Florida to play three gigs. Two weeks later they�re up in Canada at Blues on Whyte and stayed a week to record a live record, cleverly entitled, Live Blues on Whyte. Their own brand of swing and rockabilly set them apart from some of the other recent IBC winners, so let�s give the disc a listen. We shift from love to life as Sean finds himself getting buried under the minutiae of every day living in our next tune. �We all get together�we can end our misery�you might just wonder about my state of mind�don�t worry about me�I�ll be fine�and I feel�feel like I�m the only one�with all these worries�I want to get high�so I don�t know what�s going on!� Blistering fretwork from Sean provides the strong intro to �Why Do You Lie.� �Why do you lie�and worry me so�well, you let me down�now I�ve got to let you go!� His woman can�t seem to tell him the truth so Sean does what he has to do, show her the door. Time to move on to someone Sean can trust. �29 Ways,� a classic tune by Willie Dixon, is up next and here we find Sean to be a very resourceful man in pursuit of the object of his desire. �I�ve got 29 ways to get to my baby�s door�if she need�s me real bad�I can find about 4 or 5 more!� Where there�s a will there�s a way, and Sean is definitely motivated by this one. Graham�s keyboard work continues to shine and here his piano is again front and center. Sean�s band is very tight and their years together as a band make this an excellent live recording. �Call My Job� is our next cut, and here Sean is the victim of his own insanity, too much fun on the week-end. �Call my job�tell the boss I won�t be in�after Friday, Saturday, Sunday�I�ve had too much week-end!� Sean hit the numbers big on Friday, won $1,000 to play with and the rest is just one big, lost memory. On �Money�s Getting Cheaper,� this theme of spending indiscretion continues. �Times getting tougher than tougher than tough�things getting rougher than rough�I make a lot of money�but I just keep spending the stuff!� Chris Brzezicki�s bass playing really shines through on this cut as Graham takes an extended solo on his piano. Up next is �Too Many Cooks,� another tune by Willie Dixon. �Too many cooks are going to spoil the stew�too many cooks are going to spoil the stew�there ain�t nobody cooking but me and you�the stew you�re cooking�it smells so good...it�s got everybody talking in my neighborhood!� Sounds like everything will work out fine if Sean just gets out of the kitchen! The tempo slows way down on our next cut, �Life of Ease,� and I can hear Eric Blume�s brushes on the drums to start this tune off. �I live the life of ease�but I pay a hustler�s price�and if you think my style suits you�you�d better think about it twice!� Sean�s pretty set in his ways and refuses to compromise with his woman over his reefer habit. He�d rather keep smoking so this woman is going to have to go. The intricacy of Sean�s fretwork on this tune is just one example of the skills that won him the Albert King award at the IBC and is just beautifully done. Another great ballad, �What Can I Say,� finds Sean pleading his case with the woman he desires. �What can I say�what can I do�to make you understand�I�m stranded in the rain�since you left go of my hand?� A year later Sean is still trying to cope with the memories he has of this woman and it's just time to let her go. I had the opportunity to spend some time talking with Sean at this year�s IBC and I enjoyed our conversation. Sean has realistic expectations of what he�s looking to accomplish with his music and was very focused during the IBC festivities (aside from the Tuesday night at Mr. Handy�s Blues Hall, but that�s another story). He�s also a big supporter of the fight against cancer and conducts a fund-raising concert to raise money for cancer research in Ohio each fall. The best is yet to come for Sean and I look forward to catching a live performance of his very soon. Live Blues on Whyte can be found at CD Baby and is well worth the investment. 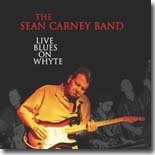 Sean Carney is another of the relatively young blues artists who are going to sustain our genre for a long time to come and this disc is a great first opportunity to hear his talents. You�ll be glad you did. Having watched the careers of Johnny Lang and Shannon Curfman rise to the forefront of the blues world, it�s interesting to note the path taken by the Perry kids --- Kyle, Ryan and Taya --- as their career continues to build. This amazing young band from Mississippi, Homemade Jamz Blues Band, tore it up at the concert that kicked off this year�s International Blues Challenge, and they�re continuing to receive national media coverage not often accorded other blues musicians. Through it all they�re relatively unaffected by the crazy world around them and concentrate on what they do best --- playing music. Their latest disc from NothernBlues Music, I Got Blues For You, features 11 original tunes written by their father, Renaud and one tastefully chosen cover. Let�s roll with it. Our first tune up, �Hard Headed Woman,� starts out with a strong bass line from Kyle before Ryan�s guitar kicks in. �Hard headed woman�thinks she�s all that�hard headed woman�won�t take me back�but�that�s ok�I�ve found another�hard headed woman!� It�s interesting to hear Ryan sing about life experiences he�s yet to live and that�s a key component of what makes this band so unique. They�re tapped into the soul of the blues without really having lived the blues. It will definitely be interesting to hear the growth in their music as Ryan and his siblings begin to write their own songs and share their life experiences with fans of their music. Shimmering cymbals from Taya set the stage for Ryan�s soulful guitar intro as Renaud�s harp kicks in on �Rumors.� Ryan tells us the story of a man who is constantly being accused of misbehaving. �I work on the job�never missed a day�but if you listen to the rumors�I�m never at the place!� This man is accused of many things but none of it is true and he continues to live his life with his head held high. Next up is �Dusk Till Dawn,� and here the man portrayed is nothing but bad. �Went to go pay my child support�said, come on in and have your way�took a good look at her with that red dress�Lord, I knew I was going to be late� and the next thing I knew�dusk turned into dawn!� The temptations prove too much to resist and the same thing happens, dusk turns into dawn! In �Roots,� we find that he�s has met his match. �That girl put some roots on me�Lord knows�I�m trying to stop giving her my time�but, she put some roots on me!� No matter how hard he tries to escape her clutches, he keeps coming back. �She put some roots on me!� �Heaven Lost An Angel� is the first real slow ballad on the disc and my favorite tune on the disc. �Sitting around here�down on my luck�something told me�man�you need a little girl�as I raised my head�to a beauty only for the Lord to see�I swear to you people�there�s an angel standing right in front of me�heaven lost an angel!� A stirring guitar solo by Ryan emphasizes his thankfulness at having been sent such a wonderful woman to love. A music duel between Renaud�s harp and Ryan�s guitar sets the tone for �Hobo Man.� �I�m a hobo man�and I just walked�in your town�I�m not looking for no kind of trouble�just a place to lay my birdies down.� This man is just drifting through and he�ll leave you alone if you do the same. Next up is trouble of a different kind, �Alcoholic Woman.� �When she�s drunk�she tells me she loves me�but when she�s sober�she pays me no mind�I can�t tell if she really loves me y�all�there�s really no telling�what�s on her mind.� Alcohol can cloud many issues and here any man will be hard pressed to ever know what the truth really is. �In the Wind� finds Ryan heading back home to see his woman. �I�m a 100 miles from nowhere and I�ve got this big Cadillac�in the wind�I�m going to see my baby�going to see my baby�once again.� The nose of his Cadillac is headed in the right direction and he�ll be home soon. I Got Blues for You closes with a cover, �Grits and Groceries,� that is very well done and then the title track. �If I don�t love you�baby�grits and groceries�eggs and poultry�and Mona Lisa was a man!� A great tune that I�ve not heard for awhile, �Grits and Groceries,� was a tune performed consistently here locally by one of our past IBC contestants, Buzz & the Soul Senders. I Got Blues for You is an excellent sophomore effort by Ryan, Kyle and Taya. The Perrys are definitely a talented bunch and the musicianship on their new record is phenomenal. They�ve come a long way since the first time I saw them onstage at the Orpheum in Memphis, and the sky is really the limit for them. I�m looking forward to the next record and hope to hear original tunes from Ryan, Kyle and Taya themselves. It�s the next step in their evolution and will definitely make for some interesting listening. In the meantime, you can grab a copy of the new disc from the Perry�s on their website, www.hmjamzbluesband.com or from their label at www.NorthernBlues.com. And catch a live performance soon if you can. You�ll be impressed with a stage presence and musicianship that is well beyond their years. The Homemade Jamz Band has returned with its sophomore effort for NorthernBlues, I Got Blues For You. Their surprising 2008 debut, Pay Me No Mind, received tons of critical acclaim and led to a tour of the U.S., Canada, and Europe. They also became the youngest band to be nominated for a Blues Music Award. The band consists of the Perry Family: singer/guitarist Ryan Perry (17 years old), bassist Kyle Perry (14), and drummer Taya Perry (10), but don�t let their ages prevent you from checking them out. As on their previous release, I Got Blues For You features the group performing songs composed by their father, Renaud, who built the guitars that his sons play and also contributes some respectable harmonica to several tracks. Ryan Perry�s fretwork is impressive, whether he�s tearing it up on a track like �Rumors� or �Heaven Lost An Angel,� laying down some straight blues on the driving �Roots� or �Hard Headed Woman,� or the slow blues of �Dusk Till Dawn.� He plays with a confidence and passion that belie his years. Unlike many youngsters playing guitar, he doesn�t overplay�..each solo is a model of taste and restraint. His gruff, gravelly vocals are well-suited for the blues and will only improve over time. His siblings are just as remarkable, with Kyle Perry providing rock-solid bass and Taya Perry ably handling the drums. I Got Blues For You is every bit as good as the band�s debut recording. It�s a powerful set of modern blues that should please fans both young and old. The Homemade Jamz Band is here for the duration and it will be interesting to see where they go from here. AZ Kenny Tsak may be a new name to most blues fans, but you would think that he�d been around for years from the sound of things on Like I Do, his new release with his band, 56 Deluxe. Actually, that�s not the case. He started playing guitar in his mid-teens, after starting out on drums, and played the local Washington, DC blues scene until forced to give it up to meet family and business obligations. He picked it up again some 25 years later after reuniting with his friend (and current bass player) Avery T. Horton. They formed 56 Deluxe in 2005 and have been burning up the music scene around Arizona and the East Coast, sharing the stage with artists like Tab Benoit, Dave Fields, Chick Willis, Calvin Jones, Joey Gilmore, Harper, and Billy Gibson. Tsak has a powerful voice with just enough grit and sandpaper, and his guitar skills are first-rate. He is as adept with the slow, stinging blues of tracks like �Full Time Lover� as the raucous roadhouse sounds of the catchy title track. 56 Deluxe is a tight little ensemble that keeps things running smoothly, with Horton on bass, James Holt on keyboards, Frank Perez on tenor sax, and Andy �G� on drums. The rhythm section of Horton and �G� is right on time (check out �Down South Florida� and �My Tastee Cake�) and there�s plenty of room allowed for Tsak, Perez, and Holt to solo and they never disappoint. This is an excellent disc that seems to have come out of nowhere. It�s not fancy, just straight-ahead blues, rock, and soul that you may not see nominated for any awards at years� end, but I guarantee you�ll listen to this one more than the ones nominated. I hate to think we missed out on 30 years of this kind of music with Mr. Tsak, but I�m glad he�s with us now. Visit the band�s website for more information and check out the 56 Deluxe Girls while you�re there. 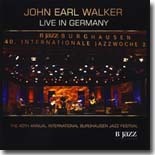 John Earl Walker had never performed in Europe prior to this year�s Burghausen Jazz Festival, but he apparently made quite an impression when he did, judging from the enthusiastic reception he receives from the audience on his latest disc, Live In Germany (Walkright Records). Walker, who has been playing since the mid '60s and was part of the '70s group, Plum Nelly, plays a vigorous brand of blues/rock with clever songwriting and a top notch band in support, which seemed to be what the doctor ordered for his audience in this case. Walker�s previous recordings have received a lot of airplay overseas as well as on the internet, so fans will find a lot to enjoy on this set, which includes 11 songs from the band�s previous CDs. Most of them come from Walker�s latest release, Come Over Here, which was released last year and was the band�s strongest effort to date. Lending Walker a hand are longtime bandmates Peter Harris (bass), Slinky Temelo (guitar), and a couple of new members � Frank Diorio (drums) and the appropriately-named Tommy Key (piano). This set should really please fans of the band, as it is basically a �greatest hits� collection since it features most of the band�s standout tunes on one CD. For fans of guitar-driven blues/rock (is there any other kind of blues/rock?) unfamiliar with the John Earl Walker Band, it�s a great starting point. Check out the band�s website and their MySpace site. 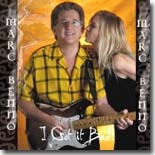 Marc Benno has been making music for over 40 years, working with musicians like The Doors, Lightnin� Hopkins, Eric Clapton, Bill Wyman, Rita Coolidge, and Leon Russell. He played guitar on The Doors� L.A. Woman album, teamed with Russell as the Asylum Choir for a couple of albums (one of which featured Clapton on guitar), and eventually formed a band in the early/mid �70s called Marc Benno & the Nightcrawlers, which included a young guitarist named Stevie Vaughan. After the Nightcrawlers disbanded, Benno joined Hopkins� band as second guitarist. By the late �80s, Benno took a break from the hectic music lifestyle and returned in the mid �90s, recording several solo albums during that time. Benno�s latest release, I Got It Bad (Blue Skunk Music) is a rocking Texas blues disc, with ten original songs and solid support from San Antonio�s West Side Horns, drummer George Rains (Jimmie Vaughan, Sir Douglas Quintet), bassist Jack Barber (Sir Douglas Quintet), and keyboardist Sauce Gonzalez (Freddie Fender). Benno wrote all the songs, most of which deal with affairs of the heart, usually a broken one. Highlights include the opening cut, �Terminal Case of the Blues,� �Texas Oil Driller,� �Torture Me,� �Save Our Love,� �My Baby�s A Gambler,� and the instrumental, �Tip Jar.� Most of these songs have a strong Texas blues feel to them, and Benno�s does a great job on guitar with economical leads and fills. Vocally, he displays more of a warm, vulnerable charm than the traditional blues growl, which suits the songs on this disc very well. I Got It Bad is a solid set of Texas blues with fine songs and excellent guitar. It�s nice to have Marc Benno back on the scene. Dave Perkins� musical career has involved working with artists like Vassar Clements, Jerry Jeff Walker, Carole King, Guy Clark, Chagall Guevara, Papa John Creach, Ray Charles, Mystic Meditations, and Passafist. You name it, he�s played it. His latest solo effort, Pistol City Holiness (Lugnut Music), is a superlative blues/rock effort that will knock you for a loop. Perkins also proves to be a songwriter that can touch on blues themes both old and new, such as �Long Eleven Road,� about a family facing unemployment woes, songs with unique outlooks on relationships (�Flown� and �Bottles and Knives�), and new twists on traditional blues, like �Devil�s Game,� featuring Perkins� searing slide guitar with Jimmy Nalls on acoustic guitar. �Preacher Blues� tackles a longtime blues theme, the Ladies Man posing as a man of God. This is blues/rock at its most manic and primal. Perkins sounds like he�s about to shred his guitar strings (not to mention his vocal chords). Harp player T J Klay threatens to blow the back off his harmonica, and the rhythm section (featuring several different bass players and drummers) are incredible. In short, if you�re a blues/rock fan at all, you absolutely need to have this disc. You will play it over and over again and it will still knock you for a loop every time. This is easily the surprise disc of 2009 so far. 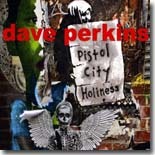 Head over to Dave Perkins MySpace site to check him out and go to CD Baby to pick this one up. Zac Harmon grew up around the Farish Street region of Jackson, MS, where he was exposed to the sounds of artists like Sam Myers, Mel Brown, and Jesse Robinson. He learned to sing, play guitar and keyboards while at church and eventually served as guitarist for Z. Z. Hill, Dorothy Moore, McKinley Mitchell, and Myers. He also taught guitar to youngsters (including Eddie Cotton) at the local YMCA. Harmon eventually relocated to Los Angeles, working as a studio musician and serving as a writer/producer for many R&B artists like Freddie Jackson, the Whispers, the O�Jays, and the Mississippi Mass Choir. Several years ago, he decided to return to his first love, the blues, and his band, the Mid-South Blues Revue, won the 2004 International Blues Challenge. His 2005 release, The Blues According to Zacariah, was a well-received effort that showcased Harmon�s myriad influences. Harmon�s most recent release, From The Root (NorthernBlues Music), is a smooth mix of blues, rock, and soul. The opening cut, �Don�t Give Me Another Reason,� is a capsule summary of the disc, with its muscular rock-edged blues guitar and funky backbeat. �Fannie Mae� is a roadhouse blues rocker featuring Jimmy Z�s frenzied harmonica. Tracks like this and �Keep The Blues Alive� and �Honey Bee� feature rock-based blues, while songs like �Scratch� and �Man Is Not Meant To Be Alone� feature a more traditional approach. Harmon proves to be adept going in either direction. Zac Harmon is the total package. He�s a great songwriter, guitarist, and singer, plus he�s equally at home playing downhome blues or Southern soul, which makes him equally appealing to two different blues fan bases. By all rights, From The Root should be a breakthrough album for him.